I have visited Croasdale Beck, in western Cumbria, twenty-eight times since 2015 and I thought I was beginning to understand it’s character (see “A tale of two diatoms” and “What a difference a storm makes”). It is the unruly sibling of the River Ehen which, usually, offers a far less amenable environment for freshwater algae. Last week, however, as we walked down the track towards the stream, we were confronted with the unexpected sight of a river bed that was bright green. Our measurements, too, showed that not only was there a lot of algae in absolute terms, but there was far more here than we had measured in the River Ehen. Usually, the situation is reversed, with the Ehen having more than Croasdale Beck. 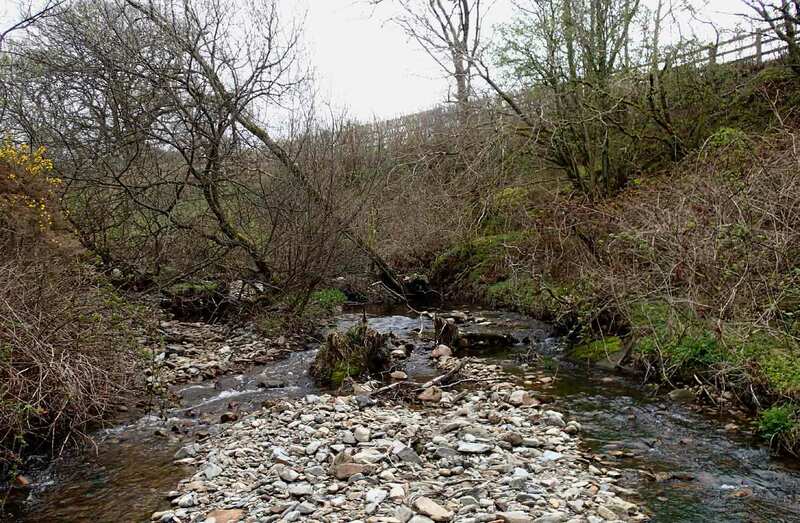 Croasdale Beck at NY 087 170 looking upstream in April 2018. The position of the gravel bar has shifted over the time that we have visited, with the wetted channel originally being at the right hand side, rather than being split into two. It was hard to capture the extent of the algae growing on the river bed in a photograph, but the macroscopic image below captures the colour of the growths well, and you’ll have to use your imagination to scale this up to cover half of the stream bed. Under the microscope, these growths turned out to be virtual monocultures of the green alga Draparnaldia glomerata. This is common in clean rivers in spring time, and I often find it in the nearby River Ehen (see “The River Ehen in February”). What my images do not show is the mucilage that surrounds the filaments. In some cases, the growths can be almost jelly-like, so prolific is this mucilage. One of the roles of this mucilage plays is to serve a matrix within which enzymes released by the fine hairs at the end of the filaments can act to release nutrients bound into tiny organic particles (see “A day out in Weardale …”). Growths of Draparnaldia glomerata in Croasdale Beck (NY 087 170) in April 2018. 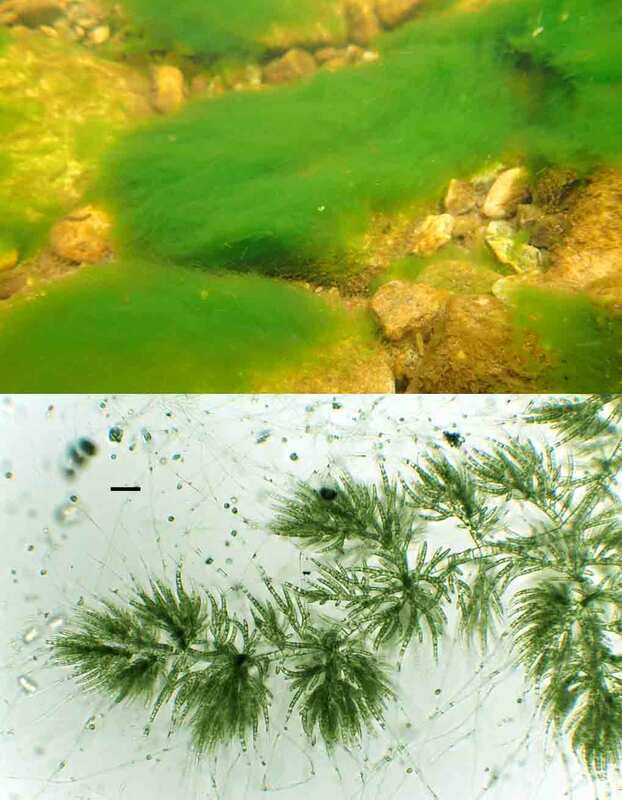 The upper image shows the filaments growing on submerged stones and the lower image shows the bushy side-branches growing from a central filament. Scale bar: 100 micrometres (= 1/10th of a millimetre). We also sample a site a couple of kilometres downstream on Croasdale Beck and, here again, the river bed was smothered in green growths. I assumed that this, too, was Draparnaldia glomerata but, when I examined the filaments under the microscope, it turned out to be a different alga altogether: Ulothrix zonata (see “Bollihope Bhavacakra” and links therein). There is little difference between the two sites that might explain this: the latter is slightly lower and is surrounded by rough pasture whilst the other is closer to the fells. However, I have seen both Ulothrix zonata and Draparnaldia glomerata at several other sites in the vicinity, and a simplistic interpretation based on agricultural enrichment does not really work. 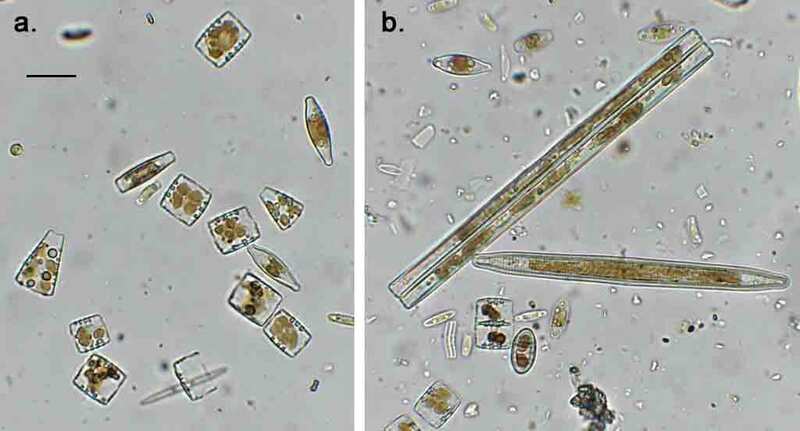 There were also a few obvious differences in the diatoms that I saw in the two samples. In both cases, we sampled stones lacking green algae but, instead, having a thick brown biofilm. Several taxa were common to both sites – Odontidium mesodon, for example (broadly confirming the hypothesis in “A tale of two diatoms …”) and Meridion circulare was conspicuous in both. However, the lower site had many more cells of “Ulnaria ulna” than the upper site. Again, there is no ready explanation but, at the same time, neither green algae or diatoms at either site suggests anything malign. Filaments of Ulothrix zonata at Croasdale Beck (NY 072 161). The upper filament is in a healthy vegetative state (although the cell walls are not as thickened as in many populations). The lower filament is producing zoospores. Scale bar: 25 micrometres (= 1/40th of a millimetre). Diatoms in Croasdale Beck, April 2018. a. upper site: note the abundance of Odontidium mesodon, plus cells of Gomphonema cf exilissimum, Achnanthidium minutissimum and Meridion circulare; b. lower site: note the presence of “Ulnaria ulna” as well as several of the taxa found at the upper site. Scale bar: 25 micrometres (= 1/40th of a millimetre). So where does this take us? I talked about the benefits of repeat visits to the same site in “A brief history of time wasting …” and I think that these data from Croasdale are making a similar point. By necessity, most formal assessments of the state of ecology are based on very limited data, from which, at best, we get an estimate of the “average” condition of a water body over a period of time. Repeat visits might lead to a more precise assessment of the “average” state but also give us a better idea of the whole range of conditions that might be encountered. Here, I suspect, we chanced upon one of the extremes of the distribution of conditions. Cold, wet weather in early spring delayed the growth of many plants – aquatic and terrestrial – as well as the invertebrates that graze them. Then the period of warm, dry conditions that preceded our visit gave the algae an opportunity to thrive whilst their grazers are still playing “catch-up”. I suspect that next time we visit Croasdale Beck will have its familiar appearance. It is, nonetheless, sobering to think that this single visit could have formed fifty-percent of the evidence on which a formal assessment might have been made. This entry was posted in diatoms, ecological assessment, Ennerdale and the River Ehen, Lake district and tagged algae, Croasdale Beck, Cumbria, diatoms, ecology. Bookmark the permalink. So is this the “down side” of using dynamic components of the ecosystem for assessing steam health. Have often wondered if the success of invertebrates was a function of their life span and the number of taxa involved. Alternatively is it just that rivers are so irritatingly variable. I used to use negative stain (nigrosin?) or Indian ink (which reveals my antiquity) to demonstrate colourless, mucilaginous sheaths around fils. of BGA etc. This is interesting as I observed a large amount of Ulothrix in our local river a few weeks ago, too. There was U. zonata and a thinner form and I observed an Ulothrix bloom it in Esthwaite Water during spring when I was sampling there. I agree in thinking that it can thrive when there are calm conditions and grazers not yet developed enough. Thanks for this thought, Lydia. I also notice that Ulothrix can arrive and depart very quickly, so it is possible (likely, even) that it can be missed, even by a monthly sampling regime in some cases. It is predictably unpredictable! There was also a thinner Ulothrix in some of the samples that I was looking at last week, though I think the U. zonata, itself, is quite variable in width, but there were definitely some filaments that were appreciably thinner than the majority. I suspect that our understanding of Ulothrix taxonomy is far from perfect.